Many athletes come to their big race of the season prepared in peak physical condition, but often overlook the important mental aspect of racing. You can have the best fitness in the world, but unless you prepare mentally, you might not race to your capability. Races are hard. They take a lot, both physically and mentally. How you approach things when the going gets tough often makes or breaks your performance. Aristotle said, "We are what we repeatedly do. Excellence, then, is not an act but a habit." Practice being excellent in training so you learn how to optimize performance on race day. Here's how. Prepare for the inevitable rough patches that occur during a race by practicing techniques to deal with tough times during training. When you get tired, shift focus away from the fatigue you are feeling and instead focus on aspects of technique that will help you perform better. For example: stay smooth and glide while swimming, pedal circles on the bike, run tall and keep your arms relaxed, etc. These sorts of cues will shift focus away from the pain and instead give control over your performance. Many athletes start to doubt themselves and question if they are ready for an event. Go back and look in your training log. Review the key workouts and remind yourself you have done the work in training and are adequately prepared for the race. You have invested a lot of time and energy into the event. Recognize that there may be unpleasant moments in the race, but you have the skills to get past them. Those uncomfortable moments won't get the best of you. You can and will finish your race strong. Another common problem is dealing with anxiety in regards to different aspects of the race. What if the water is cold? What if the water is choppy? How many hills are on the bike course? Am I going to get lost? What if I start to cramp on the run? What if I start off too fast? Make a list of the all the things you might be stressed about. Then make a list of how you might deal with each situation. 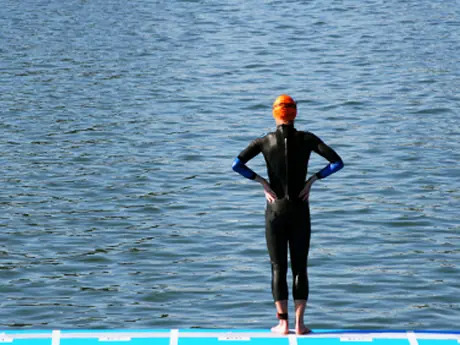 Examples to deal with these problems could be: wear a wetsuit and practice swimming in open water to hone your skills. Look at the course maps and train (or at least drive) the course prior to race day. Dial in your nutrition plan. Nail your paces during training. Thinking about all the what-if scenarios and then having a plan in place to deal with those situations will go a long way to minimize any feelings of panic.